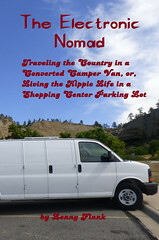 Traveling the Country in a Converted Camper Van. "Not all who wander, are lost." The science of heat flow is called “thermodynamics”, and it has been an active branch of physics since the early 1800s. It involves a lot of mathy formulas, but in essence the entire science of thermodynamics can be boiled down to one simple statement: heat always flow from high-temperature areas to low-temperature areas, and never flows from low-temperature areas to high-temperature areas (unless you add energy to the system to move it mechanically—which is what an air conditioner and a refrigerator do). So what does that mean for a van? It means that any time that the temperature outside the van is hotter than the temperature inside, the heat will always flow into the van from outside, and will never flow from inside the van to the outside. Conversely, if the temperature inside the van is higher than outside, the heat will always flow out of the van to the outside, and will never flow into the van. Heat will always flow from hotter areas to cooler areas, and the bigger the temperature difference, the faster the heat will flow. And whether the heat is flowing from inside the van out, or from outside the van in, the final result is always the same: the two temperatures will eventually equalize, and the heat will stop flowing. If it’s zero degrees outside, your van interior will cool down to zero degrees; if it is 95 outside, your van will heat up to 95. That process is inevitable; the heat will always flow from hot areas to cold until the two temperatures are the same. Everything in thermodynamics follows directly from that simple reality. But of course in a van the situation is even worse: the metal shell of the van gets heated by the sun many degrees above the actual air temperature, and it then radiates this heat into the van’s interior. When a metal box radiates heat into its interior, we call it an “oven”. This radiated heat then raises the interior temperature of the van above that of the air temperature outside. In theory, this should mean that heat will now begin to flow from high-temp area to low-temp—i.e., from inside the van to the outside—and cool the van down. And in fact many people believe (mistakenly) that this is what happens—that the van “lets the heat out”. But in reality, the heat energy that is constantly being radiated into the van from the sun-heated metal skin is far greater than the heat loss from the air in the van to the air outside—which is why the inside of a van is always hotter than the outside during the day, but drops to equalize with the outside temperature as soon as the sun goes down. So, how does “insulation” affect all this? Well, in two completely different ways, since there are two completely different types of “insulation”. The first type is the ordinary wall insulation, usually made from foam panels or spray-on insulation. This type of insulation works by using trapped air to slow down the transfer of heat energy from one area to the other. But—and this is crucial to remember—insulation does not, and cannot, alter the direction of that heat flow. The heat will still flow from the hotter area to the cooler area and will never flow from the cooler area to the hotter—no matter how much insulation there is between them. On a hot summer day, your insulation will never “let the heat out”: heat will always be flowing from the outside of the van to the inside. Insulation delays this process and slows it down, but it does not stop it or reverse it. That means the heat will always get in, and the hotter it is outside, the faster the heat will get inside your van. If you put an insulated van and an uninsulated van next to each other all day, you will find that the insulated van will be cooler inside at first, but by the end of the day the heat flow will win, and both vans will equalize with the outside temperature: they will both be just as hot inside. So unless you are actively cooling the air inside the van (and that requires an air conditioner of some sort), the best you can hope for is to have the inside of the van equalize at the same temperature as the outside. So what happens when the sun goes down? As the outside temperature drops, the heat flow in the van will reverse: now, heat will begin to flow from inside the van where it is hotter to the outside where it is cooler. In the uninsulated van, this happens through the windows and the thin walls of the van body. But in the insulated van, there is now a layer of insulation between the warmer interior and the cooler exterior—which does what insulation is supposed to do, by slowing down the heat transfer. (In reality, of course, there are always gaps in the insulation, such as the windows, which modify this process.) This means that the insulated van will cool off more slowly and stay warmer inside for longer than the uninsulated van will. Better roll down those windows to increase the airflow and equalize the temperatures. But as we have seen, in reality the inside of the van will be heated to a higher temperature than that outside, from radiant heat transmitted through the metal skin of the vehicle. To combat this, there is a second type of insulation, known as “reflective” or “radiant”—such as Reflectix. This type of insulation does not delay the transfer of heat energy at all—it works instead by reflecting radiant heat energy back towards its source and away from the inside of the van. It therefore prevents the sun from raising the temperature inside the van above the temperature outside. In terms of temperature control, it is the thermal equivalent of parking your vehicle in the shade where the sun can’t heat it up. But—and this is important to understand—radiant insulation does nothing whatever to slow or prevent the ordinary flow of heat from the air outside the van to the air inside the van. So even with a layer of Reflectix, the temperature inside will still stabilize, sooner or later, at the same temperature as outside. So where does that leave us? In the wintertime, insulation plays an important role by slowing down the transfer of heat energy from the inside of the van to the outside. This means that foam wall insulation is good at keeping heat in the van from a heater when it is cold outside. (It also means that while the insulation can slow the rate of heat loss to the outside, it cannot stop it: the van interior will inevitably cool down if the source of heat is removed, until it matches the outside temperature—so insulation accomplishes nothing at all unless there is a source of heat inside the van). In the summertime, though, the situation is different. Now, the foam wall insulation has to try to halt the flow of heat from the hot outside to the cool inside, but, unlike in winter, it is not merely slowing the flow of a relatively small amount of heat energy inside the van (produced by a heater)—it is trying to halt the heat energy from the entire planet’s atmosphere. It is an impossible task. That is why insulation is very poor at keeping heat out of the van when it is hot outside. The insulation can temporarily delay the process, but cannot stop it: the outside heat energy will always get in, and the hotter it is outside the faster it will get inside. Reflective insulation can at least help here, by stopping the sun from heating the van interior through the metal skin—but although this prevents the van interior from being heated above the outside air temperature, it can do nothing to halt the inevitable equalizing of temperature between inside and outside. When you go back to the van at the end of the afternoon, it will be just as hot inside as outside, no matter how much insulation you have. And unless you have an AC to actually cool the air, that is the very best you can do. So there it is. The iron laws of thermodynamics mean that while insulation does a quite good job at helping to keep a van warmer in the cold, it cannot do a very good job at helping to keep a van cooler in the heat. If you will be spending winters where it is very cold, you may find an insulated van useful. But if you will be spending your time where it is very hot, it will not be very helpful for you.